Note: Once you have the part that goes on your bars and the arm RAM has a huge selection of mounts and brackets to hold practically anything you can imagine from GPS to drink holders and even entire laptops (not recommended on your bike <g>) so additional investment for mounts is minimal. The inspiration for the first project comes from an Australian blog posted by "Knick Knack". The second solution was contributed by Ron Fox, a VROC member who found a creative way to re-use his old risers, the third solution comes from Bob Nafzinger whose solution doesn't even require a trip to the hardware store. As you can see in the picture at the top of the page this isn't the best looking camera platform ever devised but once everything is painted black or silver (I left it white just so it would show up in the photos) it should dissolve into the background and besides, it's simple to remove. As with any device you add to your handlebars of any value be sure you tether your camera. Hey, stuff happens and if you happen to sink your front tire into a whopper of a pothole you'll have enough problems without the camera leaving its perch and smashing on the ground. 1- PVC plug that fits into the top of the "T"
Next cut the bottom off of the "T" fitting using whatever you have at your disposal. A hacksaw works great, Dremel tool will get the job done and if you have a bandsaw then... have at it! Once cut test fit the "T" to your bars where you intend to mount them. You'll probably find you have to cut the 'legs' off the "T" as well. Be sure and leave enough so the clamps have something to grab. The photo shows a piece of old mouse pad already glued into the portion that will fit over the bars. The cut pieces of PVC can be discarded. Over your bolt slip a washer (then the optional rubber washer which may or may not reduce vibration) and attach to the 'plug' with another optional rubber washer, metal washer and locking nut as shown at right. Trial Fit (don't glue yet) the plug into the already prepared "T" and mount the assembly on your bike using the hose clamps and old mouse pad (or piece of old garden hose) for padding. Attach your camera and be sure it can actually 'see' through your windshield. If so remove everything from your bike, glue the plug into the "T", paint the assembly (including clamps) and you're finished. 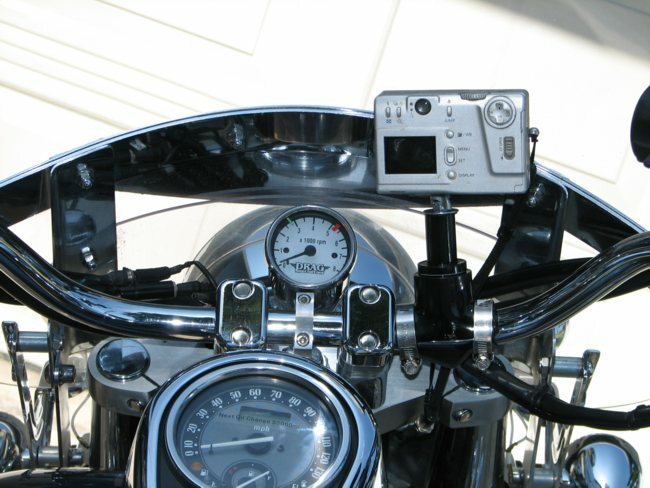 If (as is the case with the Kawasaki Nomad) the camera can't see over some part of the windshield bracket you'll need an extension. For that use a longer bolt (as needed for your purpose) and a piece of 1/2" PVC pipe as a post. You'll end up with an assembly that looks something like the one shown at right. Note in this picture a wingnut has been added. Fitted upside down this works as a locking nut against the bottom of the camera to keep it from spinning sideways. When you're finished you have an assembly that looks something like the pictures below and, while not exactly pretty it's functional and remember... it cost you $4 or less. If you've added aftermarket risers to your bike you probably tossed your originals into a box and forgot about them. Maybe you even (perish the thought) considered throwing them away. Ron took a look and simply mounted the riser upside down on his bar, added an appropriate size bolt, a couple of washers and a wing nut and voila! A simple, very solid and nearly free camera mount. The exploded view is shown at left. This is probably the simplest solution of them all involving a 1" clamp available at any motorcycle store and a Panavise Deluxe Micro Mount available under $20 at many online stores (do a Google search or check Amazon) and probably under $25 at your local camera store. The Panavise comes in 2, 4, and 6 inch lengths so determine where you'll be mounting and whether you'll need clearance from other accessories before ordering. Generally shorter will be better to reduce vibration. The picture (right) is Bob's installation. Notice his camera is held just outboard of the windshield for a clear view of the road ahead. Some riders might prefer to protect their lens from road hazards by tucking it behind the shield.